GN engineer team just back to China from Singapore client’s site, for the commissioning of GN dewatering centrifuge system, the project is to separate big solids from the waste sludge/ water of Tunneling and recover the water, the solids is qualified for landfill or disposal, since the using of water is very expensive for tunneling, the client prefer to reuse it by the dewatering centrifuge unit. VFD decanter centrifuge with feeding pump installed into the 20ft container, together with flocculation system for convenient operation and rain proof, sun proof. 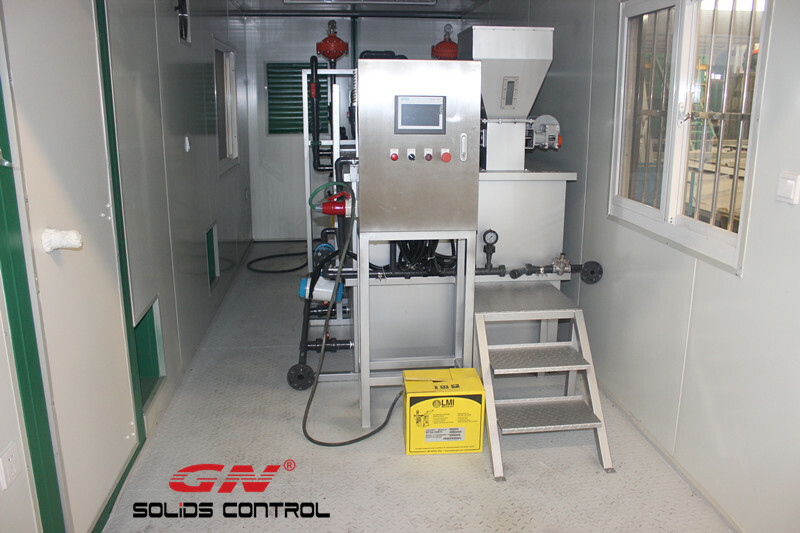 GNLW363C-VFD is the best sold model decanter centrifuge, it can be widely used for dewatering unit, solids control system, drilling waste treatment system, oil sludge separation system and all other industry waste water treatment project. The positive pressurized VFD control panel with self-cooling tube or air conditioner can allow the equipments working in high temperature weather like Middle East. The converter of the main motor, back drive motor and pump motor are all ABB brand, and the centrifuge screw is protected by tungsten carbide tiles for longer working life. The flocculation system is customized as per the chemical adding technics of the client. The mixing tank is made of stainless steel for anti- corrosion.